Red Hot Horse Racing. Coolest Kentucky Derby Party. It’s the only Kentucky Derby Party in Arizona where you can bet on live horse racing AND watch and wager on a live broadcast of the Kentucky Derby. Prepare to party at the rail at the All New Bulleit Bourbon Derby DayClub at Turf Paradise on Saturday, May 4th. The event solidifies Arizona’s love affair with things that go fast, whether they are on four legs or four wheels. Sanderson Lincoln in Phoenix returns to this one of a kind event to provide an added element of horsepower. The premiere Lincoln dealership in the Valley will be displaying luxury cars and SUV’s next to the trackside tents allowing patrons to enjoy four wheeled and four legged horsepower at the same time. 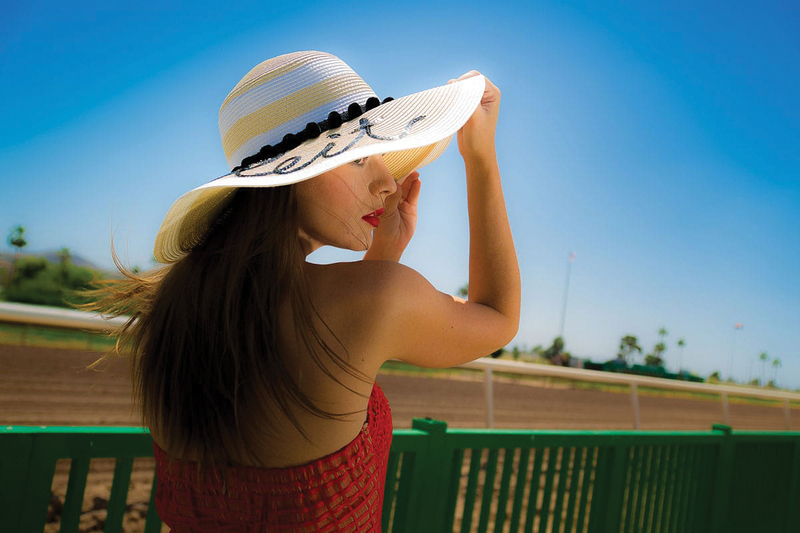 The party is just yards away from live horse racing action at Turf Paradise where fans can enjoy air-cooled tents, Turf Paradise private betting terminals, televisions to watch the local races as well as the Kentucky Derby itself. The party doesn’t end there. It’s the perfect venue to watch all the finish line action next to a no-host bar including Bulleit Bourbon Mint Juleps, beer, wine, champagne, and cocktails. There’s also a live DJ and a dance floor. The renowned Fried & Fizzy food truck will offer food adjacent to the VIP tent, offering fried chicken, salads and champagne. There are several seating options including front row, second row and third row tables and reserved seating. DayClub General Admission is $30 in advance and $35 at the door and includes admission to Turf Paradise, the air-cooled Scottsdale Polo Party-like tent along the track near the finish line, betting terminals, no-host bar including Mint Juleps, beer, wine and cocktails, DJ and 55” TVs to watch the Kentucky Derby and live local racing. Reserved seats are $60. For those wanting to kick it up a few notches, reserved tables are also available. Front Row tables: $1,000 and includes complimentary bottle of Dom Perignon. Second Row tables: $750 and includes a complimentary bottle of Veuve Clicquot. Third Row tables: $500 and includes a complimentary bottle of Chandon. The event brings together two iconic Arizona equestrians. The All New Bulleit Bourbon Derby DayClub is a joint production of the Bentley Scottsdale Polo Championships, the country’s most attended polo event and Turf Paradise, Arizona’s largest horse racing track, located in North Phoenix. The event opens at 10:30am with live racing at Turf Paradise starting at 11:30am. In addition to betting on a full card of live local horse racing, fans can also bet on the Kentucky Derby which is scheduled to run at 3:50pm. Space is limited. For more information, to buy tickets, or to reserve your table visit www.thepoloparty.com/derby.